This year’s elections have seen a record number of LGBTQ candidates running for office. Not surprisingly, the vast majority of them are running as Democrats. 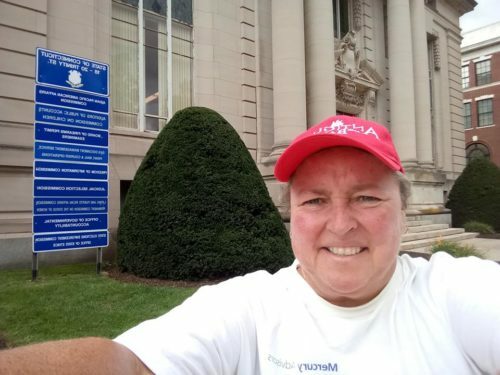 In a surprising twist, Connecticut is setting a different kind of record: six openly gay or lesbian candidates are running as Republicans for seats in the state Assembly. At present, there are two LGBTQ Democratic legislators in the Connecticut Assembly: Jeffrey Currey and Beth Wye, both of whom are running for re-election. Two additional LGBTQ candidates are also running as Democrats. One of the Republicans running this year, John Scott, had served in the Assembly before losing his race in 2016. The Republican candidates like to stress that their party is more moderate than the national GOP. When Scott married his husband, Republican House Leader Themis Klarides led members in a standing ovation. Scott and the other GOP candidates – Mary Fay, Ken Richard, Robert Smedley, AJ Kerouac, and Shaun Mastroianni – have raised eyebrows with their willingness to run as Republicans. However, the candidates argue that the Trump administration can’t roll back the gains made so far, especially when it comes to marriage equality. Of course, not everyone within the state GOP is an ally. State Sen. Joe Markley is considered one of the most conservative members of the legislature. Markley beat out LGBTQ rights supporter Erin Stewart for the party’s nominee for lieutenant governor. Markley has been endorsed by the Family Institute of Connecticut, which boasts its “long and proud association” with the hate group Focus on the Family. Richards prefers to point to Trump’s economic policies. Democrats have no incentive to engage in such cherry picking of issues. In general, they are trying to tie Republican candidates to Trump as closely as possible. Whether the gay Republicans succeed in spite of a predicted blue wave remains to be seen. Several are running in most conservative districts, which would favor the GOP candidate. Should they all succeed, it will not only be a milestone for Connecticut, they will have increased the number of out LGBTQ elected Republican officials nationwide by nearly 50% (from 13 to 19). By contrast, the current number for Democrats is 555.